Put an end to back pain with Nubax, a therapeutic back traction device that works in as little as three minutes, three times a day. Get relief from your back pain as you rediscover pain-free living. Order your Nubax risk-free today! At Nubax™, we believe that you deserve to live without feeling hindered by pain. Enter our groundbreaking Nubax™ therapeutic traction device—A clinically tested technique that provides proven results to people who may have lost hope of ever feeling better. Our therapeutic traction device is guaranteed to get you back to doing what you love or your money back—be it playing with your children, gardening, or simply enjoying life. Our simple in-home device requires no need for prescription medication or surgery—it's 100% natural and easy to use. The moment you start to feel pain, you can address it promptly and effectively with Nubax. Nubax™ is a patented device that uses a scissor-like action to give a gentle form of traction to the spine. It can assist in strengthening the spine and maintaining the health of your back as a part of your routine fitness regimen. Nubax™ is portable, lightweight, easy to use and under your control at all times. Nubax™ uses a clinically tested technique that provides proven results to people who may have lost hope of ever feeling better. Our device is guaranteed to get you back to doing what you love or your money back—be it playing with your children, gardening, or simply enjoying life. Unlike other devices on the market, you can rest assured that Nubax™ has been clinically tested on being effective in spinal decompression. The Nubax™ uses gravity to initiate a stretch whereas other products that require you to be in a standing position will not achieve the same level of relief. If you're suffering from back pain and seek to alleviate your discomfort, Nubax is a safe and simple traction device that can be utilized for those affected by ailments including sciatica, scoliosis, ruptured discs, spinal degeneration, pinched nerves, rheumatoid arthritis, back stiffness, prolapsed discs and bulging discs. In just three uses a day for three minutes, you can experience the freedom from pain you've always hoped for. Backed by multiple forms of scientific research, Nubax has been shown to resolve back problems quickly and efficiently. The benefits don't just stop once you're feeling better – it can even be used to maintain your progress for years to come. Discover for yourself why more than 100,000 satisfied customers around the globe choose Nubax every day. Nubax is a therapeutic traction device designed to increases the space between the vertebrae of your spine, removing the pressure from your nerves. There are no adverse forces involved such as on an inversion table. You're in a neutral position with your frame perfectly aligned, making it suitable for those who haven't found solutions through other avenues. You won't have to worry about getting into uncomfortable positions or complicated instructions. This small, compact device can even be easily packed up and brought with you on your travels! Nubax users have reported reduced pain, increased flexibility, increased mobility, a higher level of performance in sports and more. Nubax is proudly backed by a risk-free, 100% money back guarantee–if you don't find relief with Nubax, simply return your device for a full refund. 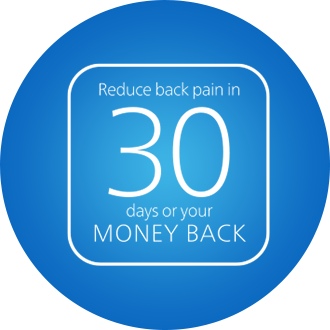 Let's put an end to your back pain today–order your therapeutic Nubax now!